One of the tiring things about living in a tiny boat is the fact that you can never just open a cupboard, reach in and get out what you want. You always have to move 6 things to find the one you’re looking for, then put them all back in exactly how they came out. That is now exaggerated to the max here on Yohelah after my trips to Costco, Mega Depot and two grocery stores, and the resulting loss of $1,000 from our bank account. How I stashed a thousand dollars worth of food I have no idea, but I do know that every locker and the freezer is brimming to the top. We even disconnected the starboard water tank and filled it up with canned goods (and a little beer and wine too). Hopefully we have enough food to get us through French Polynesia and into the Cook Islands where we can afford to reprovision again. We also took a day off from projects and took a little tour with a bunch of other cruisers up the Rio Chagres. There were some indigineous families that moved from the Darien province in the 70’s into Panama City looking for a better life and opportunities. Finding the city no place to raise their children and missing the rivers of the Darien, they found the Chagres River about an hour outside of Panama City. They moved up the river and built a village. In the 80’s the Panama Canal Authority declared the area a national park, but allowed them to remain as long as they didn’t clear any more land or harvest food and fish commercially. 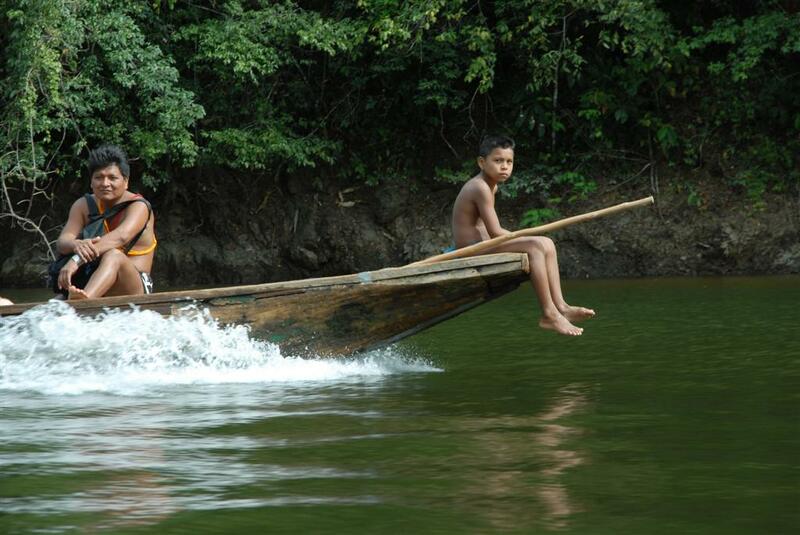 Today there are 120 people living in the small community of Embera Drua and they’ve embraced tourism as an opportunity to make money so they can remain on the river and raise their children. We were motored up in canoes and toured the village, ate a delicious fish lunch and shopped for handmade baskets and goods. They then treated us to some music and dancing and sent us along our way home. All in all it was a lovely day and an interesting tour. The people were all very friendly and it was refreshing to see them managing to maintain the lifestyle they enjoyed in such a remote and beautiful area. 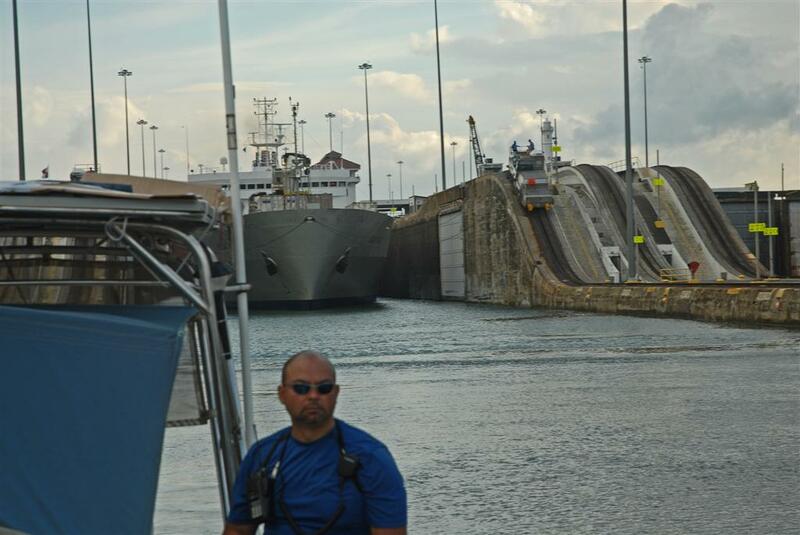 We also took a trip through the Panama Canal with our friends Chris & Heather on their boat Legacy. We first met them in Mazatlan in early 2007 and have seen them off and on several times since then. They’re headed up the Caribbean and to Florida next spring. We delayed our departure from Panama City because we wanted to make a trip through the canal as line handlers and it was nice to go on a boat that we knew. Fortunately and unfortunately it was all very routine and there was little excitement. Everyone knew what to do and the uplocking through three locks went smooth as can be. We were lucky to be side tied to a big charter power boat who has been through many many times and knew the drill completely. On our way out we were tied to the wall with a huge freighter right behind us. All in all it was completely uneventful and we made it through all the way to the marina on the other side before dark. So now the to-do list is clear enough to launch out of here and head west and north. We’re very excited to be exploring more of the beautiful islands of Panama and get back into warm clear water for some diving. We don’t have as much time as we’d like but it seems we just never do. There are a ton of anchorages in Panama and a few in southern Costa Rica we’ll chose from as we scoot north. I’ll update the passage blog as we travel towards Costa Rica, where we’ll meet up with T2 in mid-February. Then my after T2 leaves my sister is coming down for some cruising in the waters of Northern Costa Rica. Today on Yohelah we’re loaded up and ready to launch….